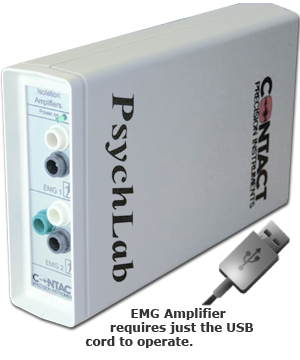 Multi-media computer systems now provide a complete digital solution to apply to the study of emotion in single subjects or dyads. In the past video mixing consoles required split screen technology, expensive recording apparatus, monitors, and so on. 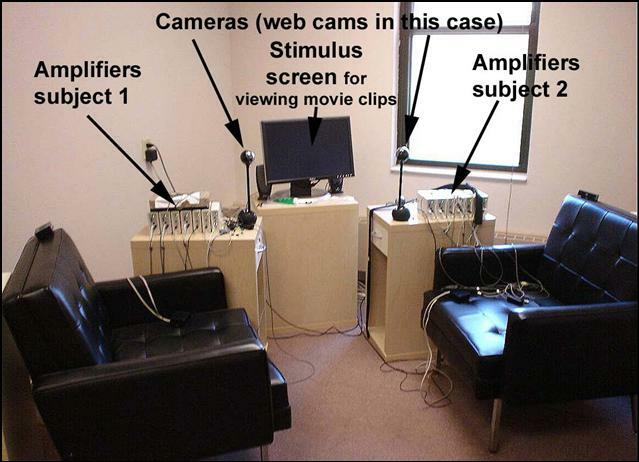 Now it is possible to capture synchronized video images from two cameras directly onto computer disk while simultaneously recording physiology on the same computer. Inexpensive web-cameras, or professional devices like the high resolution tracking camera shown, may be used. With the tracker camera, the experimenter can pan and tilt using controls on the computer screen (from behind a screen or in an adjacent room) to follow movement and zoom in and out. The camera was developed for security applications and provides more than sufficient range for lab monitoring, with excellent low light capability. 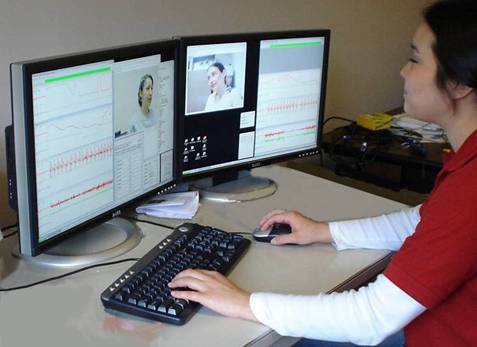 Video images may be replayed on the computer synchronized with the physiology record. 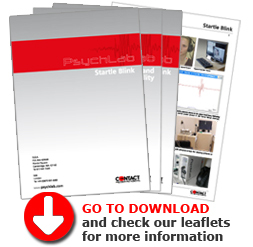 Off-line coding is added to the physiology record, (e.g., for coding specific emotional behaviours, or coding behaviour at the moment of specific physiological events). The physiology record is then analyzed using our data analysis system software and macros which produces information in time epochs relative to code and stimulus. As needed video recorded on the hard drive may be copied onto DVD disk for viewing on another computer or converted for viewing on a DVD machine. 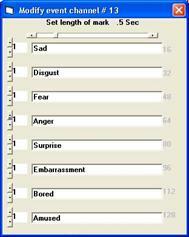 Facial EMG is an important indicator of emotional facial movement, as well as startle eyeblink responses. 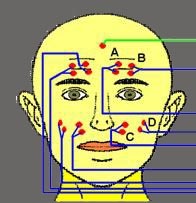 Multiple electrode sites provide a comprehensive report of minute changes in the facial muscle activity. Electrode pairs are positioned 1cm apart across each muscle to be measured. Rectified EMG. EMG is an AC signal within frequency bandwidth 28Hz – 500Hz, as in the green and blue traces. For the purpose of quantification, it can be rectified and integrated. This turns the high frequency AC signal produced when the muscles fire into something that can be meaningfully evaluated over time. The resulting integrated wave can be evaluated for average and maximum signal level in given time periods, and thus performance is compared in different stages of the experiment. 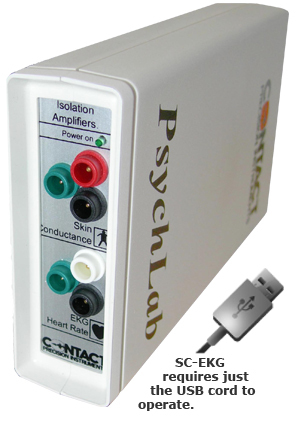 Skin conductance is measured by applying 0.5V across a pair of electrodes normally positioned on the medial phalange of the first and second fingers. At this electrode site, minute changes in sweating based on the ‘fight or flight' response (i.e., autonomic activation) can be picked up. At very sensitive levels, waves can be seen in the SC trace, known as phasic responses. In analysis these fluctuations may be automatically counted and evaluated for amplitude. Total count and amplitude are presented in given time epochs, giving an indication of arousal. 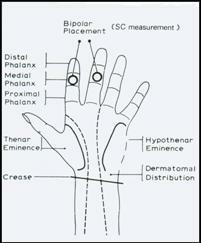 More information on SC measurement is found in the Skin Conductance section on this site. Heart rate is most accurately measured using EKG picked up by electrodes positioned either side of the heart. 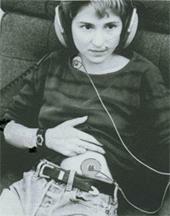 It may also be obtained using the peripheral pulse amplifier, with finger clip or earlobe transducers. Convenient EKG electrode positions are shown in the picture. The SC-EKG amplifier pictured above may also be used for this measure. The red trace is raw EKG and the green trace is Heart Rate, which is evaluated every time a new beat is detected. Changes in heart rate may be observed in different stages of the experiment. 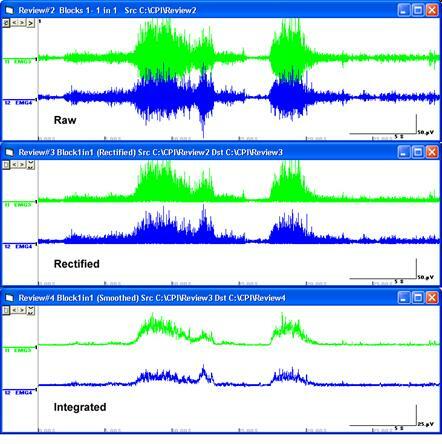 Heart Rate Variability and Vagal Tone Index may be evaluated by exporting raw heart rate data into other software. For subject self-rating, a rating dial is available. 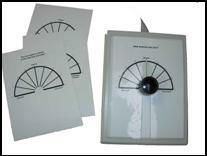 The legend can be printed out with your own design using a template picture file which we supply with the dial.